Learn how websites are made. Is there a better alternative to Learn HTML? Is Learn HTML really the best app in HTML category? Will Learn HTML work good on macOS 10.13.4? Learn HTML is for begginers. No programming background required. Have you ever wanted to learn how websites are made? Do you want to redesign your blog? The first step is learning the HTML language! LEARN BY EXAMPLE: View the HTML source code of any website, including "tags" that define the layout and structure of each page. Don't know what a tag means? Just tap on a highlighted tag to see a description, with examples. REVIEW: Includes reference on 30+ most commonly used HTML tags, from images, to links, to tables. Learn HTML needs a rating. Be the first to rate this app and get the discussion started! 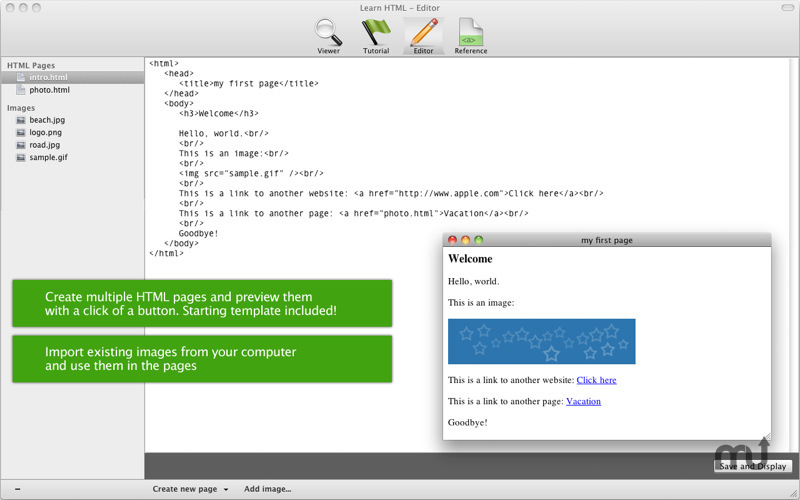 CREATE: Interactive editor lets you write HTML code (example included!) and view the resulting page. No Web server necessary. Save multiple files, or import images from your hard drive to use in your pages. BONUS: Includes a 10 page "crash course" tutorial describing HTML syntax, the fundamentals of creating a simple website, and common mistakes to avoid.